It’s here again the annual Christmas Eve reading of Clement C. Moore’s Twas the Night Before Christmas by Rosie and Jessica’s dad. This is its fifth outing and we hope it is as much a part of your Christmas as it as of ours. In this special Operation Get Festive Episode, Rosie and Jessica are once again fundraising for the very important Crisis at Christmas campaign. You can find out more about Crisis at their website and donate Rosie and Jessica’s Just Giving page. You can find more festive tip and tricks on our Twitter. Here to rescue your 2016, it’s the annual Christmas Eve reading of Clement C. Moore’s Twas the Night Before Christmas by Rosie and Jessica’s dad. We’ll be making time for it around our annual screening of The Muppet Christmas Carol and the dinnerladies Christmas specials. You can support Operation Get Festive this year by donating to Crisis at Christmas. In this special Operation Get Festive Episode, Rosie and Jessica are fundraising for the very important Crisis at Christmas campaign. 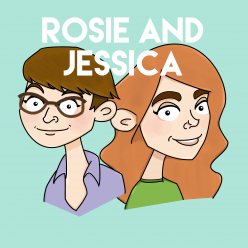 You can find out more about Crisis at their website and donate to receive a special bonus episode at Rosie and Jessica’s Just Giving page. You’ve been waiting for it and here it is, the culmination of Operation Get Festive, our annual Christmas Eve tradition: Rosie and Jessica’s dad reads Clement C. Moore’s Twas the Night Before Christmas. We’ll be having our own live reading at home very soon, as we do every year, so get together your smoked salmon sandwiches, your yule log and your not quite working angel chimes and relax. Merry Christmas! In this special episode, Rosie and Jessica introduce their annual Operation Get Festive, a month long series of tips and tweets to get you in the festive mood. Today they kick off the series on December 1st with, what else, the advent calendar and the Blue Peter advent crown. Follow along and add your own festive exploits using #RJgetfestive – we’ll be tweeting throughout the month. Here we are, our annual Christmas Eve tradition: Rosie and Jessica welcome special guest, their dad, to the podcast to bring you the Christmas tradition of a reading of Clement C. Moore’s ‘Twas the Night Before Christmas‘. You’ll need a Yule log, the Muppet Christmas Carol and some smoked salmon sandwiches to complete the scene. A very merry Christmas from us to you.